There are just a few tickets left for the rare opportunity of a tour of the Garrick Club tomorrow, Wednesday 1st July, as part of the HUGUENOT SUMMER Festival. Click here to book yours. 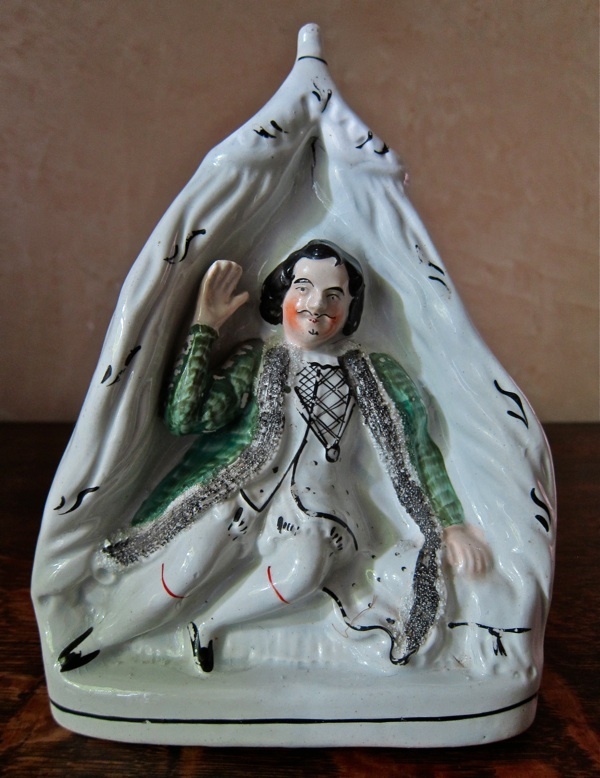 This modest Staffordshire figure of c.1840 upon my dresser illustrates a pivotal moment in British theatre, when David Garrick made his debut aged twenty-four as Richard III at Goodman’s Fields Theatre in Aldgate on Monday 19th October 1741. 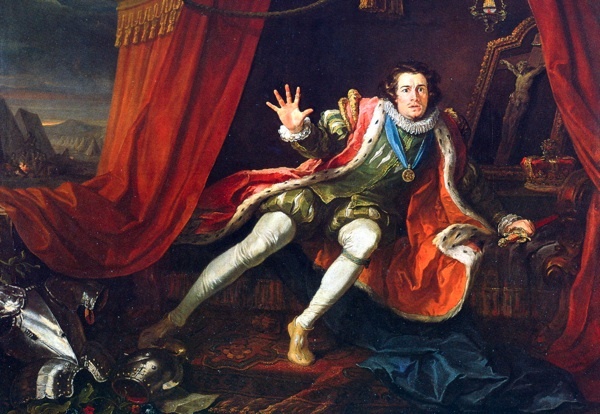 Based upon William Hogarth’s painting, it shows Garrick in the momentous scene on the night before the battle of Bosworth Field when those Richard has killed appear to him in a dream foretelling his death and defeat next day. The equivocal nature of the image fascinates me, simultaneously incarnating the startling ascendancy of David Garrick, a new force in the British theatre who was to end up enshrined in Westminster Abbey, and the sudden descent of Richard III, a spent force in British monarchy who ended up buried in a car park in Leicester. You can interpret the gesture of Garrick’s right hand as attention seeking, inviting you to “Look at my acting” or, equally, it can be Richard’s defensive move, snatching at the air with fingers stretched out in horror. It is, perhaps, both at once. Yet my interest is in Garrick and how he became an overnight sensation, introducing a more naturalistic acting style to the London stage and leading the Shakespearean revival in the eighteenth century. And it all started here in the East End, just a mile south of Shakespeare’s first theatre up the road in Shoreditch. Garrick’s family were Huguenots. His grandparents fled to London in 1685 and David was born in 1717 as the third of five children while his father Captain Garrick was travelling the country with a recruiting party. Suitably enough, at the age of eleven, David played the part of Kite in George Farquhar’s The Recruiting Officer. Then, in 1737, since there was no money to pay for university, David and his literary classmate Samuel Johnson left their school in Lichfield to walk to London and seek their fortunes. But the sudden death of Captain Garrick within a month delivered an unexpected legacy that permitted David to set up a wine business in the Strand with his brother Peter. In that same year, the Licensing Act closed all the playhouses in London except Drury Lane and Covent Garden, yet the management of the unlicenced Goodman’s Fields Theatre managed to get a dispensation to present concerts. Far enough east to avoid the eye of the Lord Chamberlain, they bent the rules with posters declaring concerts – even if the performances they advertised were actually plays. 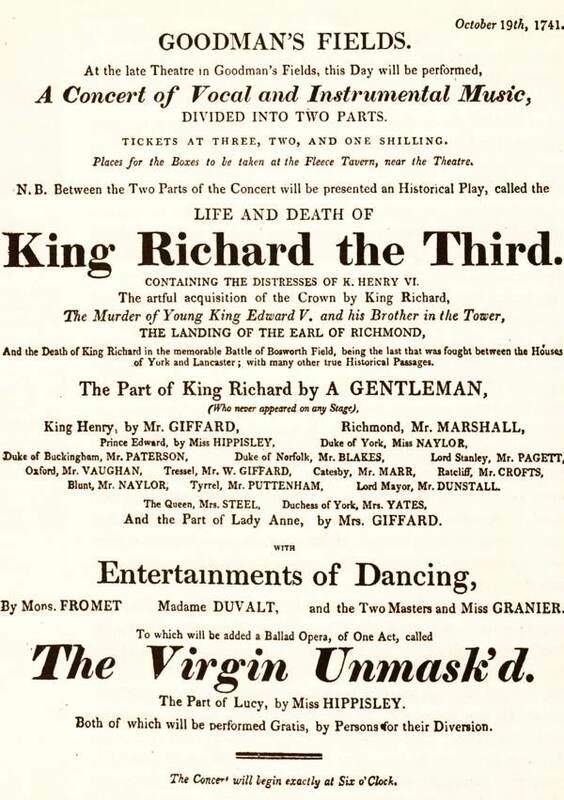 Thus Richard III is advertised as a “A concert of vocal and instrumental music” at “the late theatre in Goodman’s Fields.” David Garrick’s name as the leading actor is not given, he is merely referred to as “A GENTLEMAN (Who never appeared on any stage)” - a common practice at this theatre. 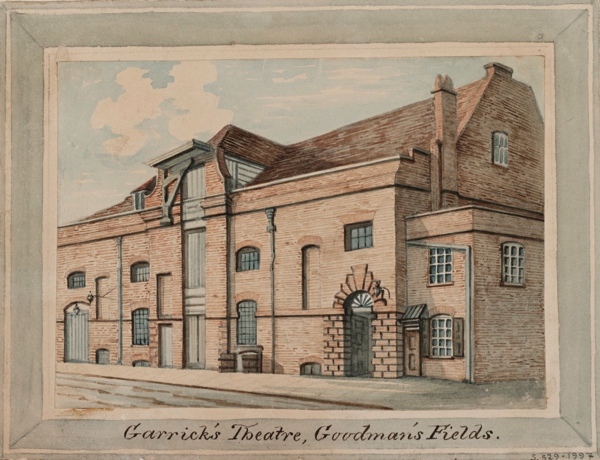 Yet the success that Garrick brought to the Goodman’s Fields drew attention to the unlicensed theatre – forcing its closure within six months by the authorities, encouraged by the managements of Drury Lane and Covent Garden who were losing custom to their East End rival. Meanwhile, Garrick considered his options and, after a triumphant summer season in Dublin, he walked onto the stage of Drury Lane as an actor for the first time on October 5th 1742 and he had found his spiritual home. The myth of Garrick as the gentleman who stepped onto the stage, drawn magnetically by his powerful talent and declared a genius of theatre upon his first appearance, concealed a more complicated truth. In fact, Garrick had taken his first professional speaking role on the stage that summer in Ipswich, appearing under the name Lyddall. His own play, Lethe or Aesop in the Shades, had been produced at Drury Lane the year before. And, having played Harlequin in an amateur performance in the room above St John’s Gate in Clerkenwell, he took over at Goodman’s Fields Theatre one night when the actor performing the role became sick. So Richard III was far from Garrick’s first time in front of an audience, although it was the moment he chose to declare his talent, and it is likely that he made significant preparation. William Hogarth’s painting of David Garrick as Richard III, 1745. The playbill for David Garrick’s debut at Goodman’s Fields Theatre. 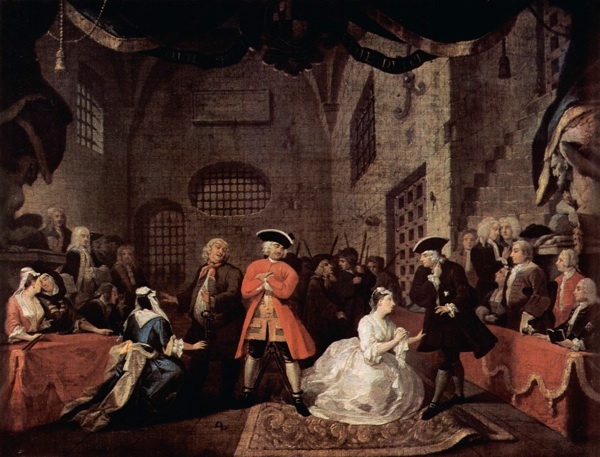 The Goodman’s Fields Theatre, Ayliffe St.
William Hogarth’s painting of The Beggar’s Opera by John Gay, performed as the closing production at Goodman’s Fields Theatre on May 27th 1742. 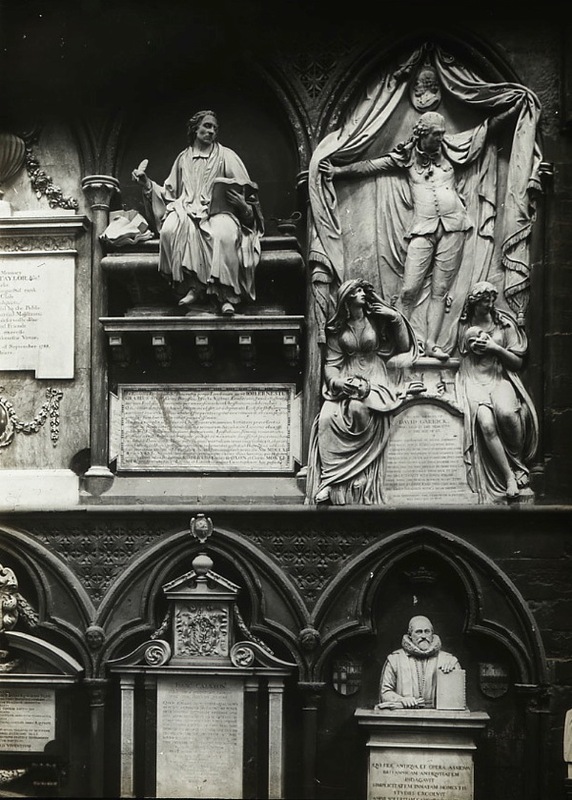 David Garrick’s monument in Westminster Abbey is to be seen on the top right of this glass slide. So life doesn’t change – the show business celebrity gains huge fortune and fame and the intellectual who makes a major contribution to the English world was over-shadowed (at least initially). An interesting account that makes me marvel at how an actor’s fame can endure for so long with no tangible evidence of his talent beyond the reviews of his contemporaries. I have often wondered whether these great personalities would cut the mustard on a modern stage. Without recordings, film or television, what did the audiences of the 1740′s have to compare against the performances of the like of Mr Garrick. Were his speeches delivered realistically or were they declaimed in a melodramatic fashion? I should like to have seen his first performance as Richard 111 and also his 90th… Now that really would be a testament to his growth as an actor.